It was unclear at the time of this writing whether or how the early-morning Sunday, June 12, terrorist attack on an Orlando, Florida nightclub that killed at least 49 clubgoers and wounded more than 50 other persons will impact the week's and the month's legislative calendar. While the attack was carried out by an individual who was born in New York, indications are that his parents were born in Afghanistan. It was uncertain at the time of this writing, however, whether the fact of the perpetrator's U.S. citizenship would make any difference with those who have in the past used previous terrorist attacks within the United States or elsewhere around the world as an opportunity to launch legislative attacks on immigrants, immigration, or refugees. Both the House and Senate have ready-made vehicles that were already scheduled for action this week that could serve as vehicles for those seeking to respond legislatively to the Orlando terrorist attack. In the House, the Committee on Appropriations is scheduled this week to take up the appropriations bill that funds the Department of Homeland Security. And in the Senate, the full body is set this week to take up the appropriations bill that funds the Department of Justice, and the Committee on the Judiciary is scheduled this week to mark up a bill that would make it easier to denaturalize U.S. citizens involved in terrorist activity. As it now stands, the Senate and House of Representatives are set to accelerate the pace of their work on immigration-, human trafficking-, and refugee-related legislative activity during the week beginning on June 13, 2016, with a heavy schedule of floor action and several hearings and markups on the subjects on the week's legislative calendar. Most of the more significant immigration- and human trafficking-related legislative activity for the week is scheduled to take place on the House side of the Capitol dome, where that body's Committee on Appropriations is scheduled to take up the FY '17 appropriations bill that funds the federal government's border security, interior immigration enforcement, and immigration services, agencies, functions, and activities. While the text of that measure had already been written prior to the Orlando terrorist attack, it could now serve as a vehicle for amendments reacting to the attack. The full House of Representatives this week also is scheduled to take up a number of immigration- or human trafficking-related measures, including bills on human organ harvesting and trafficking and a bill on visa processing. And at least three hearings are scheduled in the House on the subjects, including a House Homeland Security subcommittee hearing on the national security implications on visa overstays, a House Oversight and Investigations Committee hearing on the operations of the Department of State, and a House Foreign Affairs Committee hearing on international religious freedom. The full Senate is set to complete its consideration of a FY '17 Defense Authorization measure that contains a number of significant immigration- and human trafficking-related provisions. And it is expected to begin its consideration of the FY '17 appropriations bill that funds the federal government's immigration court system. The latter measure, which is the FY '17 Commerce, Justice, Science, and Related Agencies Appropriations Act, could serve as a vehicle for Orlando-related floor amendments. In addition to the scheduled Senate floor action on those two measures, several Senate committees are holding markups and hearings, including the oft-scheduled markup of the "Expatriate Terrorist Act" and a hearing on the Coast Guard's drug and human interdiction activities. In all, prior to the Orlando terrorist attack, this week's immigration, human trafficking, and refugee-related legislative agenda featured four hearings, the potential markup of five bills, and scheduled floor consideration of six measures that either contained significant immigration-, human trafficking-, or refugee-related provisions or could have served as vehicles for amendments on those subjects. See the highlights of the likely and possible immigration, human trafficking, and refugee-related legislative agenda for the week ahead after the jump. With both major parties now having presumptive 2016 presidential nominees, the headliner guest on the June 12, 2016 Sunday Public Affairs programs will include insurgent 2016 Democratic presidential candidate Bernie Sanders (I-VT), Speaker of the House Paul Ryan (R-WI), Senator Jeff Flake (R-AZ), and officials from the campaigns of the two major party presumptive nominees. Ryan recently unveiled a House Republican Conference anti-poverty blueprint for 2017 and beyond. However, he spent much of his time afterward continuing to field questions about 2016 GOP presidential nominee-in-waiting Donald J. Trump's criticisms of a Hispanic judge because of the judge's ethnicity.. And Flake made headlines last week for refusing to endorse his party's 2016 presidential nominee. Also scheduled to appear on the June 12 programs are Trump supporter, Senator Jeff Sessions (R-AL) and Clinton enthusiast Senator Amy Klobuchar (D-MN), and the usual assortment of political pundits, journalists, and operatives. A sneak peek at the guest lists for the upcoming June 12, 2016, editions of each of the five major network Sunday public affairs programs appears after the jump, along with previews of the likely discussions on those programs about immigration, refugees, and the Latino vote. The Senate and House of Representatives return this week from simultaneous week-long recesses, with a relatively small number of immigration-, human trafficking-, or refugee-related items on the week's legislative schedule. The Senate returns to the Nation's Capitol today and the House comes back to Washington tomorrow. Upon its return, the House is scheduled to remain in session for three weeks before taking a week-long Independence Day recess that is expected to begin upon the close of business on Friday, June 24th and last through Monday, July 4th. When the Senate returns, it is scheduled to remain in session for the better part of five weeks, taking off only three workdays during that period: Friday, July 1st, Monday July 4th, and Tuesday July 5th.. Notwithstanding the relatively small number of immigration-, human trafficking-, or refugee-related items on the week's legislative schedule, however, the week's legislative activity could yield immigration-, human trafficking-, or refugee-related legislative action, including the markup in the Senate of one of the two appropriations bills that fund the nation's refugee functions, Senate floor consideration of a Defense Authorization measure that contains a significant number of immigration-related items and could be the target for other floor-related amendments on the subject, and a House committee markup of a visa vetting bill that has already been approved by another committee. In all, this week's immigration, human trafficking, and refugee-related legislative agenda features just one hearing, the potential markup of three bills, and scheduled floor consideration of two measures that either contain significant immigration-, human trafficking-, or refugee-related provisions or could serve as vehicles for amendments on those subjects. There was plenty of talk about Trump, ethnicity, immigration, and/or the Latino vote on the June 5, 2016, Sunday public affairs programs. All three of the remaining major party 2016 candidates for president of the United States appeared on at least one of the June 5, 2016, Sunday public affairs programs, as did the newly minted Libertarian party 2016 presidential nominee. However, of the four presidential candidates appearing on the programs, only Donald J. Trump addressed the issue of immigration and the Latino vote. Most of the comments that were made on Sunday about Trump, ethnicity, immigration, and/or the Latino vote were made the non-candidate guests on the shows, including comments made by Majority Leader Mitch McConnell (R-KY), Representative Donna Edwards (D-MD), Senate Foreign Relations Committee Chairman Bob Corker (R-TN), NBC's Andrea Mitchell, The National Journal's Ron Fournier, Stanford's Lanhee Chen, Fox News's Brit Hume, and others, with some declaring him or his actions racist and others expressing exasperation about having to answer questions about some of Trump's more racially tinged proposals. A summary of the discussions about immigration and the Latino vote that occurred during the June 5, 2016, editions of each of the five major network Sunday public affairs, along with video excerpts of those discussions, appears after the jump. On the eve of next Tuesday's California and New Jersey primaries, all three of the remaining major party 2016 candidates for president of the United States are scheduled to appear on at least one of the June 5, 2016, Sunday public affairs programs: likely Democratic presidential nominee former Secretary of State Hillary Clinton, presumptive Republican nominee businessman Donald J. Trump, and insurgent Democratic candidate Senator Bernie Sanders (I-VT). Joining the three major party candidates on at least one of the programs will be Libertarian nominee, former Governor Gary Johnson (R-NM). Also appearing on the programs this week will be a number of legislators, including Senate Majority Leader Mitch McConnell (R-KY) and Representative Donna Edwards (D-MD), several former presidential candidates, and the usual assortment of political pundits, journalists, and operatives. A sneak peek at the guest lists for the upcoming June 5, 2016, editions of each of the five major network Sunday public affairs programs appears after the jump, along with previews of the likely discussions on those programs about immigration, refugees, and the Latino vote. After engaging in a frenetic pace of work during the week of May 23rd, that included the Senate's inability to take any meaningful action on an immigration-laden defense authorization measure and the inability of the House to pass an energy and water appropriations bill that contains a controversial provision on sanctuary cities, the House and Senate have begun a week-long recess. The Senate is scheduled to return to the Nation's Capitol on Monday, June 6, and the House returns on Tuesday, June 7. A lot of work was accomplished during he week of May 23rd. However the sputtering at week's end may well portend a storm ahead that could shutdown the appropriations process, consigning the four appropriations bills that traditionally fund the nation's immigration, border, and refugee functions to being included at year's end to a now all-too-familiar omnibus spending measure. Stay tuned to ThisWeekInImmigration.Com for highlights of the past week's action on immigration, human trafficking, and refugee-related legislative agenda as well as a look ahead to likely action on those subjects once Congress returns from its recess..
2016 Democratic insurgent candidate Bernie Sanders (I-VT) was the only presidential candidate appearing on the May 29, 2016, Sunday public affairs programs, and he did not address the subjects of immigration or the Latino vote during his appearance. However, there was plenty of talk about those subjects from others appearing on the venerable programs, with the most heated discussion occurring during CBS's "Face the Nation" program's political roundtable segment. Other guests who commented about immigration, ethnicity, or the Latino vote included defeated GOP 2016 candidate Senator Marco Rubio (R-FL), who discussed presumptive 2016 Republican presidential nominee Donald Trump's positions on immigration; and Senate Homeland Security and Governmental Affairs Committee Chairman Ron Johnson (R-WI), who discussed the security of the U.S. refugee program and Trump's proposed ban on Muslims. A summary of the discussions about immigration and the Latino vote that occurred during the May 29, 2016, editions of each of the five major network Sunday public affairs, along with video excerpts of those discussions, appears after the jump. Democratic insurgent candidate Bernie Sanders (I-VT) is the only presidential candidate appearing on the May 29, 2016, Sunday public affairs programs. However, presumptive 2016 Republican presidential nominee Donald J. Trump is sending his two top aides to the programs. Also appearing on the programs this week will be a number of legislators, including former 2016 GOP presidential candidate Senator Marco Rubio (R-FL), Senate Intelligence Committee Vice Chair Senator Dianne Feinstein (D-CA); Republican National Convention Platform Chairman Senator John Barrasso (R-WY); Senate Homeland Security and Governmental Affairs Committee Chairman Ron Johnson (R-WI); and Senator James Lankford (R-OK). And this week's programs also will feature the usual assortment of political pundits, journalists, and operatives. A sneak peek at the guest lists for the upcoming May 22, 2016, editions of each of the five major network Sunday public affairs programs appears after the jump, along with previews of the likely discussions on those programs about immigration, refugees, and the Latino vote. The House and Senate are scheduled to engage in a frenetic pace of work during the week beginning May 23, 2016, as they attempt to complete action on a number of measures before leaving Washington at week's end for simultaneous week-long Memorial Day recesses. Upon the close of business this week, the Senate will depart the Nation's Capitol, not to return until Monday, June 6, while the House will be away until Tuesday, June 7. But before the many over-worked lobbyists and legislative aides who populate Capitol Hill can begin to enjoy the less frenetic pace of a recess, they will have to endure the multitude of legislative actions that are scheduled to take place between now and the end of the week, including an unusually heavy workload of immigration-, human trafficking-, and refugee-related legislative activity. Among the significant immigration-, human trafficking- and refugee-related legislative actions that are scheduled during the week is Senate floor consideration of its 1,666 page-long FY '17 National Defense Authorization Act, a measure that contains a number of immigration- and human trafficking-related provisions and that could see more than a dozen floor amendments on those subjects filed during the Senate's consideration of the measure. In all, this week's immigration, human trafficking, and refugee-related legislative agenda features three hearings, the potential markup of nine bills, and scheduled floor consideration of as many as many as two measures that either contain significant immigration-, human trafficking-, or refugee-related provisions or could serve as vehicles for amendments on those subjects. National security will be a big focus on the May 22nd Sunday public affairs programs with several aviation experts, cabinet officials, and Members of Congress who have made national security the focal point of their careers appearing to discuss the downing of EgyptAir’s Flight 800. But Presidential politics will also be a big topic on the programs as 2016 Democratic presidential frontrunner Hillary Clinton and her insurgent challenger, Senator Bernie Sanders (I-VT) make appearances on the programs. Congress kicks into high gear during the week beginning May 16, 2016, with lots of committee and floor action planned (including a great deal of immigration- and refugee-related activity) during what is scheduled to be a four-day work week in the House and a five-day work week in the Senate.. The highest profile action in Congress during the week will be floor consideration in both chambers of separate measures that would appropriate emergency supplemental fiscal year 2016 funding to combat the Zika virus. But there is a lot of action occurring during the week-to-come that has nothing to do with the Zika virus, including a great deal of activity on measures that either contain significant immigration-, human trafficking-, or refugee-related provisions or that could be a target for amendments on those subjects. Among the significant immigration- or refugee-related legislative activity that is scheduled during the week is House floor consideration of its FY '17 National Defense Authorization Act, a measure that contains a number of immigration- or refugee-related provisions and that could see as many as 15 amendments on those subjects during floor consideration. Also scheduled for the week is a Senate Judiciary Committee hearing on declining deportations and the release of criminal aliens into the United States; a House Appropriations subcommittee markup of the fiscal year 2017 spending measure that traditionally funds the federal government's immigration court system; House floor consideration of legislation reauthorizing the U.S. Commission on International Religious Freedom; and numerous other markups and hearings. In addition to monitoring the above actions, the pro-immigrant and Pro-refugee advocacy communities will be watching floor action in both chambers to see if any senators or representatives attempt either to attach immigration- or refugee-related riders to the Zika supplemental measures or to go after immigration- or refugee-related spending as an offset to the Zika funds. In all, this week's immigration, human trafficking, and refugee-related legislative agenda features two hearings, the potential markup of seven bills, and scheduled floor consideration of as many as five measures that either contain significant immigration, human trafficking, or refugee-related amendments or could serve as vehicles for amendments on those subjects. For the first time since last fall, not one presidential candidate appeared on any of the Sunday morning public affairs programs. Notwithstanding the absence of a candidate, however, the May 15, 2016, programs were still dominated by discussions about presidential politics. As has been the case for some time now, most of the talk about immigration on the May 15th Sunday programs centered around 2016 Republican presidential nominee Donald J. Trump, including his proposed ban on Muslims entering the United States, the wall he has proposed building, and his call to deport 11 million undocumented aliens living in the United States. Among those commenting were elected officials, such as Representative Keith Ellison (D-MN), the first Muslim ever elected to the United States Congress; an varied political journalists, political strategists, and pundits. A summary of the discussions about immigration and the Latino vote that occurred during the May 15, 2016, editions of each of the five major network Sunday public affairs, along with video excerpts of those discussions, appears after the jump. For the first time in months, not one presidential candidate is scheduled to appear on any of the Sunday public affairs programs during the May 15th Sunday programs. Notwithstanding the absence of Presidential candidates, a number of top political figures are scheduled to appear on the programs this weekend. Among them areformer Speaker of the House Newt Gingrich (R-GA); Republican National Committee Chairman Reince Priebus; Senator Jeff Merkley (R-OR); and Representatives Tom Cole (R-OK), Keith Ellison (D-MN), Chris Collins (R-NY), Peter King (R-NY),Tim Huelskamp (R-IN), and Marsha Blackburn (R-TN). And as always, the programs also will feature a host of political operatives, journalists, and pundits. A sneak peek at the guest lists for the upcoming May 15, 2016, editions of each of the five major network Sunday public affairs programs appears after the jump, along with previews of the likely discussions on those programs about immigration, refugees, and the Latino vote. Both the House and Senate return to Washington this week from a week-long recess. Once back, they will remain in session through Friday, May 27th, at which time they will begin simultaneous week-long Memorial Day recesses. While the agenda of scheduled action for this week is relatively light on significant immigration-, refugee-, and human trafficking-related legislative activity, that agenda could heat up in the second two weeks of the work period, with House and Senate floor action likely on their respective Defense Authorization Bills; action possible in the House on its FY '17 budget resolution, and action possible on several of the four regular appropriations bills that fund the nation's border security-, interior immigration enforcement-, immigration services-, refugee admissions-, overseas refugee assistance-, refugee resettlement-, and human trafficking-related appropriations agencies, functions, programs, and activities. In all, this week's immigration, human trafficking, and refugee-related legislative agenda features three hearings, the potential markup of three bills, and no scheduled floor consideration of any measures that contain significant immigration, human trafficking, or refugee-related amendments. While there was lots of talk about immigration and the Latino vote during the May 8, 2016 Sunday public affairs programs, very little of it came from the presidential candidates, even though both the presumptive Republican presidential nominee and the frontrunning Democrat for that party’s nomination both appeared on at least one of the five programs. With the 2016 Republican presidential race over and the Democratic race all but over, the featured appearances by the two major party presidential candidates who are expected to contend against each other in November of 2016:. But there was little talk about immigration or the Latino vote from the two candidates. In addition to former Secretary of State Hillary Clinton, and presumptive 2016 Republican nominee Donald J. Trump, other top political figures who appeared on the May 8th programs included the 2008 Republican nominees for president and vice president, Senator John McCain (R-AZ) and former Governor Sarah Palin (R-AK); House Democratic Caucus Chair Xavier Becerra (D-CA); and Senator Jeff Flake (R-AZ); all of whom discussed either immigration or the Latino vote during their appearances. Also appearing on the programs was a host of political operatives, journalists, and pundits. A summary of the discussions about immigration and the Latino vote that occurred during the May 8, 2016, editions of each of the five major network Sunday public affairs, along with video excerpts of those discussions, appears after the jump. With the 2016 Republican presidential race over and the Democratic race all but over, the May 8, 2016 Sunday public affairs programs will feature appearances by the two major party presidential candidates who are expected to contend against each other in November of 2016: former Secretary of State Hillary Clinton, and presumptive 2016 Republican nominee Donald J. Trump. In addition to the two presidential candidates, other top political figures who will appear on the programs this weekend include the 2008 Republican nominees for president and vice president, Senator John McCain (R-AZ) and former Governor Sarah Palin (R-AK); House Democratic Caucus Chair Xavier Becerra (D-CA); and Governor Pat McCrory (R-NC). And the programs also will feature a host of political operatives, journalists, and pundits. A sneak peek at the guest lists for the upcoming May 8, 2016, editions of each of the five major network Sunday public affairs programs appears after the jump, along with previews of the likely discussions on those programs about immigration, refugees, and the Latino vote. The May 1, 2016 Sunday public affairs programs will feature appearances by four of the five remaining 2016 presidential candidates: Democratic 2016 frontrunner and former Secretary of State Hillary Clinton; Republican 2016 presidential frontrunner Donald J. Trump; Senator Ted Cruz (R-TX), who is making a relatively rare appearance on the Sunday programs but appearing this week on all five of them; and insurgent 2016 Democratic presidential candidate Senator Bernie Sanders (I-VT), who has become a regular staple on the venerable shows. Choosing not to appear on any of the programs this week is Governor John Kasich (R-OH). In addition to the two presidential candidates, top political figures who will appear on at least one of the Sunday programs include senior campaign officials for all five of the still-active 2016 presidential campaigns. A sneak peek at the guest lists for the upcoming May 1, 2016, editions of each of the five major network Sunday public affairs programs appears after the jump, along with previews of the likely discussions on those programs about immigration, refugees, and the Latino vote. The House and Senate are set to begin simultaneous week-long recesses after the close of business on Friday, April 29th. Before leaving town, both chambers will face a relatively light schedule of immigration-, refugee-, and human trafficking-related legislative activity. Indeed, at the time of this writing, just four hearings, two (with one likely-to-be-postponed) markups, and no scheduled floor activities on those subjects are on tap for this week. As light as the schedule for this week is, at least one of the week's scheduled activities could prove to be impactful; a House committee is planning to hold a hearing during the week-to-come at which it will hear from survivors of victims of crimes perpetrated by criminal aliens. Those witnesses will testify after the committee first has an opportunity to rake the head of Immigration and Customs Enforcement (ICE) over hot coals. If a similar hearing that was held last week in the House Committee on the Judiciary is any guide, the hearing could be emotional. The April 24, 2016 Sunday public affairs programs featured appearances by only two of the five remaining 2016 presidential candidates: Governor John Kasich (R-OH), and Senator Bernie Sanders (I-VT). Choosing not to appear on any of the programs this week were former Secretary of State Hillary Clinton; Republican frontrunner, businessman Donald J. Trump; and Senator Ted Cruz (R-TX). In addition to the two presidential candidates, top political figures who appeared on at least one of the Sunday programs include Republican National Committee Chairman Reince Priebus, Democratic National Committee Chairwoman Debbie Wasserman Schultz, Donald Trump, Jr., and a host of other strategists, operatives, journalists, and pundits. Neither of the two candidates appearing on the programs addressed immigration or the Latino vote during their appearances. However, the subject of immigration was addressed by several other politicos appearing on the programs, as well as by panelists on several of the programs’ political roundtable segments. From an immigration- and refugee perspective, however, none of the appearances on the April 24 programs -- or on any of the Sunday programs so far this year – tops the appearance by Koch. A summary of the discussions about immigration and the Latino vote that occurred during the April 24, 2016, editions of each of the five major network Sunday public affairs, along with video excerpts of those discussions, appears after the jump. The April 24, 2016 Sunday public affairs programs will feature appearances by only two of the five remaining 2016 presidential candidates: Governor John Kasich (R-OH), and Senator Bernie Sanders (I-VT). Choosing not to appear on any of the programs this week are former Secretary of State Hillary Clinton; Republican frontrunner, businessman Donald J. Trump; and Senator Ted Cruz (R-TX). In addition to the two presidential candidates, top political figures who will appear on at least one of the Sunday programs include Republican National Committee Chairman Reince Priebus, Democratic National Committee Chairwoman Debbie Wasserman Schultz, Donald Trump, Jr., and a host of other strategists, operatives, journalists, and pundits. A sneak peek at the guest lists for the upcoming April 24, 2016, editions of each of the five major network Sunday public affairs programs appears after the jump, along with previews of the likely discussions on those programs about immigration, refugees, and the Latino vote. The Senate Committee on Appropriations today approved a measure that would provide level funding for the nation's immigration court system in fiscal year 2017 while leveling strong criticisms of the agency that administers it for its failure to hire additional trial attorneys and its treatment of unaccompanied alien children during legal proceedings. Today's Committee action occurred in connection S. 2837, the Fiscal Year 2017 Commerce, Justice, Science, and Related Agencies Appropriations Act (FY '17 C-J-S Bill), which it marked up and approved by a vote of 30-0. Summary of the Bill's Immigration-Related Provisions. The ﻿﻿Committee-approved measure would appropriate $426.791 MILLION in fiscal year 2017 for the Department of Justice's Administrative Review and Appeals Unit, the vast majority of which would go to the Executive Office for Immigration Review (EOIR), which operates the federal immigration court system, It is the same amount that was appropriated for EOIR in fiscal year 2016. However, if enacted, it would be $10.653 MILLION less than the Administration requested for fiscal year 2017. Directives and Criticisms. The ﻿committee report accompanying S. 2837 contains a number of immigration- and human trafficking-related references, including directives and references relating to EOIR's backlog of cases; EOIR's failure to hire immigration judges as directed by Congress; training for immigration judges on children's cases; the legal orientation program for the custodians of undocumented children (LOPC Program); policy on federal detainers; the bar on Legal Services Corporation (LSC) representation of illegal aliens, sanctuary cities, funding for the State Criminal Alien Assistance Program (SCAAP); the use of Victims of Trafficking Grants, and assistance to T-Visa applicants. The Senate today passed legislation reauthorizing the Federal Aviation Administration (FAA) through the end of fiscal year 2018. As passed by the Senate, the measure does not contain any immigration- or refugee-related provisions. However, from an immigration and refugee perspective, the most notable aspect of the Senate's consideration of the measure was that several floor amendments relating to those policy areas were filed to the bill but were never taken up by the Senate. The Senate-passed measure now moves to the House, where the process makes it highly unlikely that immigration- or refugee-related amendments will be attached to it. The Solicitor General of the United States will argue this week before the Supreme Court of the United States in a case that could determine the limits of the executive branch’s power to exercise prosecutorial discretion in the enforcement of the nation’s immigration laws. The oral arguments are scheduled for 10:00 am on Monday, April 18, in the chamber of the Supreme Court in the case of U.S., et. al., v. the State of Texas, et. al., in which the state of Texas, joined by 25 other states, have so far successfully sought to block implementation of the Obama Administration's executive actions providing relief from deportation and work authorization for the parents of U.S. citizens and parents of Legal Permanent residents. The Senate Committee on Appropriations last week approved fiscal year 2017 spending allocations for its 12 subcommittees, including the four subcommittees that appropriate funding for the federal government’s border security, interior immigration enforcement, immigration services, refugee admissions, overseas refugee assistance, unaccompanied alien child, and refugee resettlement functions. The Committee-approved FY ‘17 allocations are slightly increased over fiscal year 2016 spending for the two subcommittees that have primary appropriating jurisdiction over the federal government’s immigration-related functions. However, they are slightly reduced for the two subcommittees that have primary appropriating jurisdiction over refugee spending. The allocations that the Committee adopted last week are known as 302(b) allocations because they are proscribed by Section 302(b) of the Congressional Budget and Impoundment Act of 1974. The Committee’s adoption of them means that it is free to take up its spending bills for the coming fiscal year. The headliner action on immigration in the Nation's Capitol. this week will actually take place across the street from the U.S. Capitol Building as the Supreme Court of the United States prepares to hear oral arguments in the case of the U.S., et. al. v. the State of Texas, et. al., a case challenging the executive branch's discretion on immigration policy. Not only will the Court hear arguments from the Department of Justice and the State of Texas when it entertains oral arguments on Monday, but in an unusual move, it also will entertain oral arguments from the U.S. House of Representatives, which will contend that in exercising what his Administration calls "prosecutorial discretion" in enforcing the nation's immigration laws, President Obama has failed to honor his obligation under Article II, Clause 3 of the the U.S. Constitution that the President "shall take Care that the Laws be faithfully executed." In addition to the immigration action occurring in the chamber of the Supreme Court, plenty will be taking place in the Capitol Building, itself, this week. In all, the week's immigration, human trafficking, and refugee-related legislative agenda will feature four hearings, the potential markup of four bills, and the floor consideration of at least one measure that could become a target for immigration, human trafficking, or refugee-related amendments. The April 17, 2016 Sunday public affairs programs featured appearances by three of the five remaining 2016 presidential candidates: former Secretary of State Hillary Clinton, Governor John Kasich (R-OH), and Senator Bernie Sanders (I-VT). But Secretary Clinton was the only one of them who addressed immigration on the programs. Choosing not to appear on any of the programs this week were Republican frontrunner, businessman Donald J. Trump; and Senator Ted Cruz (R-TX). While the programs were full of other top political figures, the only other guest who touched on immigration or refugee matters on any of them was actor and Democratic activist George Clooney. A summary of all of the discussions about the immigration- or refugee-related discussions on the programs follows after the jump. Senator Marco Rubio (R-FL) has filed an amendment in the Senate that would terminate the automatic eligibility for federal public assistance for Cuban nationals who arrive in the United States while maintaining eligibility for those benefits for Cuban nationals who can demonstrate that they have been persecuted and are in need of resettlement assistance. The ﻿﻿﻿﻿Rubio Cuban Refugee Benefits Amendment﻿﻿﻿﻿ was filed as one of more than 300 proposed amendments to H.R. 636, legislation pending on the Senate floor that would reauthorize the Federal Aviation Administration (FAA). His amendment is drawn from ﻿S. 2441﻿, “The Cuban Immigrant Work Opportunity Act of 2016,” which the Florida senator introduced in the Senate in January of this year. The Chairman of the Senate panel responsible for appropriating funding for foreign assistance pledged yesterday that he will work to provide substantial increases in humanitarian and development assistance to front-line Middle Eastern countries during the fiscal year 2017 budget cycle in order to promote stability, dissuade radicalization, and alleviate refugee crises throughout the region. But while his Democratic counterpart voiced general support for the idea, he also expressed skepticism over how possible it would be for his colleague to win the enactment of increased funding for those purposes. The pledge to work for increased humanitarian assistance was made by Senator Lindsey Graham (R-SC), who chairs the Senate Appropriations Subcommittee on State, Foreign Operations, and Related Programs, during a Tuesday, April 12, 2016, Subcommittee hearing that featured an appearance by Bono, the lead singer of U2. During the hearing, Graham said of the effort he is about to undertake, "I'm going to work with [Subcommittee Ranking Democrat] Senator Leahy and the members of this Committee to put together an emergency relief package. And if you don't think this is an emergency, I welcome the contest. I welcome the debate." The House returns from its two week-long Spring recess on Monday, April 11, joining the Senate, which returned to action in the Nation's Capitol last week. Upon the return of the House, the two chambers will remain in session for three weeks until they begin simultaneous one week-long recesses during the week of May 2nd. For the week of April 11, the immigration, human trafficking, and refugee-related legislative agenda includes four hearings or briefings, one markup, and three floor actions. See the highlights of the likely and possible immigration, human trafficking, and refugee-related legislative agenda for the week ahead, as well as a look at the big picture on such legislation from 10,000 feet, after the jump. week ahead after the jump. A number of factors make it likely that the months ahead will make for a bumpy ride for those interested and involved in immigration and refugee legislation and policy. These include the ongoing drama of the 2016 presidential elections, the uncertainty over which party will control the Senate after the dust settles on the 2016 Senate elections, the likelihood that the Supreme Court of the United States will render a decision in late June on the limits of executive branch discretion and the proper balance of power between the legislative and executive branches on immigration, the possibility of a summer surge of unaccompanied alien children along the southwest border, and the ever-present danger that some unforeseen tragedy could occur either in the United States or elsewhere around the world that hardens attitudes about immigration and refugees. And did we mention the 2016 presidential election yet? A look at "the big picture" on immigration and refugee legislation as Congress gears up for the next three weeks of legislative activity follows after the jump. Despite the fact that three of the five remaining major party candidates for President of the United States appeared on at least one of the April 10, 2016, Sunday morning public affairs programs, there was scarcely any talk about any immigration, refugees, or the Latino vote during those shows. Indeed, the only mention of even one of those subjects came from President Barack Obama, who briefly alluded to immigration during his appearance on Fox’s “Fox News Sunday” program. In all, the programs ﻿featured ﻿appearances by Democratic frontrunner, former Secretary of State Hillary Clinton; Governor John Kasich (R-OH); and Senator Bernie Sanders (I-VT). However, neither of the three candidates were asked about or volunteered to bring up immigration, refugees, or the Latino vote during their appearances. Choosing not to appear on any of the programs this week were Republican frontrunner, businessman Donald J. Trump and his main challenger for the nomination, Senator Ted Cruz (R-TX). A summary of the discussions on all of the programs follows after the jump. As appropriators in both chambers take the initial steps towards moving the fiscal year 2017 appropriations bills through Congress, a key appropriations subcommittee chairman is calling for "multiple billions" of dollars in emergency humanitarian and development assistance to front-line countries in the Middle East in order to avoid the collapse of those countries' governments. The suggestion for emergency assistance to front-line Middle Eastern countries was made by Senator Lindsey Graham (R-SC), Chairman of the Senate Appropriations Subcommittee on State, Foreign Operations, and Related Programs, the subcommittee that has appropriating jurisdiction over foreign assistance program. President Barack Obama reacted with unequivocal condemnation and ridicule yesterday to a proposal from 2016 Republican presidential campaign frontrunner Donald J. Trump that the United States government intercept remittances sent by undocumented aliens living in the United States to family members in Mexico and and use the intercepted funds to pay for the construction of the 35 foot-high wall between the two countries that he has proposed building during his campaign. The president declared that the proposal on remittances and others from Mr. Trump, as well as proposals by Mr. Trump's his closest rival for the 2016 GOP nomination, Senator Ted Cruz (R-TX), are wrong for the country and harmful to U.S. foreign policy interests. President Obama's remarks about the dangers of various proposals by Mr. Trump and Senator Cruz were made during an impromptu Tuesday, April 5, 2016, appearance he made before the White House press corps prior to that day's regularly scheduled White House Daily Briefing from White House Press Secretary Josh Earnest. See more about the Trump proposal and the President's reaction to it, including video of the President's response, after the jump. ﻿House and Senate Republicans yesterday filed separate amicus briefs with the Supreme Court of the United States opposing the Obama Administration's Executive Actions on Immigration. As a technical matter, the House brief was filed on behalf of the entire U.S. House of Representatives, even though every Democrat in the chamber voted against authorizing its filing. The ﻿﻿﻿Senate Brief﻿﻿﻿ was filed on behalf of 43 of the Senate's 54 Republicans. The two briefs were filed on Monday, April 4, 2016 in the landmark case of the United States of America, et al v. Texas, at al, in which the state of Texas, joined by 25 other states, have so far successfully sought to block implementation of the Obama Administration's executive actions providing relief from deportation and work authorization for the parents of U.S. citizens and and parents of Legal Permanent residents. A federal district court in Texas last year enjoined the Administration from implementing the policy, and the Fifth Circuit Court of Appeals has upheld the injunction. The Obama Administration is seeking relief from the Supreme Court. Four of the remaining major party 2016 presidential candidates appeared on the April 3, 2016, Sunday public affairs programs. However, of the four candidates only two briefly addressed or alluded to the subjects of immigration or the Latino vote. Most of the talk about immigration during the April 3rd programs came either from Republican National Committee Chairman Reince Priebus, who appeared on all five of the venerable programs, the pundits panels, or the moderators of the programs. A summary of the discussions about immigration and the Latino vote that occurred during the April 3, 2016, editions of each of the five major network Sunday public affairs programs appears after the jump. The House Committee on Homeland Security has approved legislation that would require the Secretary of Homeland Security to submit a report on the border, terrorism and criminal threats at the southwest U.S. border. The bill also would require the Secretary, acting through the Chief of the Border Patrol, to issue a strategic plan by no later than June 30, 2017, and every five years, thereafter, evaluating threats and efforts to mitigate them. The Committee action occurred in connection with H.R. 4482, the "Southwest Border Security Threat Assessment Act of 2016". The Committee approved the measure by a voice vote during a March 23, 2016, markup after first agreeing to a number of amendments to it. Now that the House Committee on the Homeland Security has approved H.R. 4482 and ordered it reported to the full House, the next step in the legislative process is for the Committee to formally report it to the House. At the time of this writing, no timetable had been set for that action. The full House of Representatives has approved a resolution authorizing Speaker of the House Paul Ryan (R-WI) to file an amicus brief in the Supreme Court of the United States on behalf of the U.S. House of Representatives in the case of the United States of America, et al v. Texas, et al, a case challenging he Administration's Executive Actions on Immigration. House action occurred on Thursday, March 17, 2016, in connection with H. Res. 639, a House resolution introduced in the U.S. House of Representatives by Speaker Ryan. ​The House approved the resolution by a vote of 234-186. Since House resolutions are neither forwarded to the Senate for its consideration nor sent to the President for his or her action, House passage of H. Res. 639 was the end of the line for the measure. But the House is expected to file the brief, pursuant to the authority in the resolution, shortly. See a complete write-up on House floor action in connection with H. Res. 639 after the jump. The House Committee on the Judiciary has approved a measure that Democrats contend would have prevented Jews fleeing Nazi Germany from being accepted as refugees in the United States and that Republicans asserted was necessary to protect the United States from persons who intend to harm it, as well as to protect the prerogatives of Congress to set refugee admissions policy. The committee action occurred in connection with H.R. 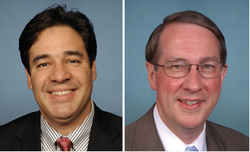 4731, the “Refugee Program Integrity Restoration Act of 2016”, introduced by Representative Raul Labrador (R-ID) with the strong support of House Judiciary Committee Chairman Bob Goodlatte (R-VA). ​The Committee acted during a three hour-long markup session that was held on Wednesday, March 16, 2016, approving the controversial measure by a party line vote of 18-9. See a complete write-up on the House Committee on the Judiciary's markup of H.R. 4731 after the jump. The House Committee on Ways and Means has approved a measure that would deny the refundable portion of the Child Tax Credit to undocumented aliens. The Committee action occurred on Wednesday, March 16, 2016, in connection with H.R. 4722, a measure introduced in the U.S.. House of Representatives by House Ways and Means Subcommittee on Social Security Chairman Sam Johnson (R-TX). The Committee approved the measure on a party line vote of 21-15 after first agreeing to a substitute amendment offered by House Ways and Means Committee Chairman Kevin Brady (R-TX). Notwithstanding the Committee's approval of H.R. 4722, the measure's ultimate fate is uncertain in the House; its consideration by the full House may depend on whether the House takes up a controversial Fiscal Year 2017 B1udget Resolution that the House Committee on the Budget narrowly approved on March 16. See a complete write-up on the House Committee on the Judiciary's markup of H.R. 4722 after the jump. The House Committee on the Budget has approved a budget resolution containing nonbinding language disapproving of the admission of refugees from Syria and Iraq. However, the fate of the question of whether the measure will ever be brought before the full House of Representatives is in doubt. The committee action occurred on Wednesday, March 16, 2016, in connection with H. Con. Res. 125, a resolution establishing the congressional budget for the United States Government for fiscal year 2017 and setting forth the appropriate budgetary levels for fiscal years 2018 through 2026. The committee approved the Budget Resolution by a vote of 20-16 after first considering and then rejecting an amendment on immigration reform that was offered by panel member John Yarmuth (D-KY), along with a host of other Committee Democrats..
See a complete write-up on the House Committee on the Budget's markup of its FY '17 Budget Resolution after the jump. The House Committee on Foreign Affairs has approved an amended version of a resolution expressing concern about reports of systematic, state-sanctioned organ harvesting from non-consenting prisoners of conscience in the People's Republic of China. The Committee action occurred on Wednesday, March 16. 2016, during a House Foreign Affairs Committee markup of H. Res. 343, a resolution introduced in the House by Representative Ileana Ros-Lehtinen (R-FL). The Committee approved the measure by a voice vote after first agreeing to an amendment in the nature of a substitute. See a complete write-up on the House Foreign Affairs Committee markup of . Res. 343 after the jump..